The President, Parliament, and government are close to a mutual understanding, said President Yushchenko in an 'Inter' TV interview. He explained that after the introduction of changes in the constitution, there was no effective legal document which would regulate the relations between the Presidential Secretariat and the Cabinet of Ministers, and that this had complicated collaboration between three branches of authority. Among achievements, Yushchenko mentioned receipt of market economy state status, and the completion of the process of preparation for entrance into the WTO. He also considers significant collaboration with the EU as a 'strategic axis for foreign policy' and reminded listeners that Ukraine in 2006 signed a major collaboration agreement "which mentions the prospect of membership of the EU". According to Yushchenko, the purpose of the Putin-Yushchenko commission was to solve all political problems and strategic questions in order to improve bilateral relations. In his turn, premier Viktor Yanukovych stated in an interview for "Ukrayina" TV on Saturday that there are no conflicts between himself and the President Yushchenko. "If anyone has this impression, that we are pulling in different directions, then this not so. We have one common purpose - the growth of the economy and improvement in the welfare of our people," said Yanukovych. "There was no war between us, there is no war, nor will there be." added Yanukovich. Looks like someone's knocked their heads together. Wonder how long the cessation of hostilities will last. Happy New Year to everyone out there! This is the time to look forward and for analysts and pundits to make predictions about what the New Year will bring. There's been much speculation about possible early VR elections next spring. There has been talk about rifts in NSNU, BYuT, and in PoR; as well as disagreements amongst the anti-crisis coalition bloc members themselves. The current anti-crisis coalition comprises unnatural bed-fellows, and any future coalition could be formed by today's implaccable enemies working together for their own individual gain. If BYuT continue to rise in popularity, I have no doubt politicians and businessmen from rival parties will try to cross-over from political bloc to political bloc, just as they have in the past, with minimal soul-searching. Ivan Stepanovych Plyushch, a wily old veteran of Ukrainian politics, was recently asked in an interview: "Is there a chance of effective cooperation between Yushchenko and Yanukovych?" He replies, "Viktor Yushchenko and Viktor Yanukovich have only one [realistic] perspective - I started to talk about this after the second round of presidential elections. If the two Victors eventually comprehend that responsibility for the future of Ukraine rests on their shoulders, then they should find compromises and try, for two and a half or three years, to change the situation in the country for the better. Then there will be [good] prospects for both them and at us. If this does not happen, there will be elections for everybody and everything." I hope both Viktors take heed of Plushch's advice, but somehow I don't think they will. In politics, particulary where there is the polarisation that exists in Ukraine, it is vital to show your opponents that you are not the ogre that you are painted by your enemies. After the Orange Revolution Yushchenko failed to make any attempt to ingratiate himself in Ukraine's Eastern regions. Yanukovych has made some effort with his detractors, e.g. by speaking in Ukrainian in public, but has not visited Western Ukraine since becoming PM, and has not addressed these people directly. In recent times has been pulling disgraced politicians and prosecutors 'out of their coffins' and putting them into positions of power again. There is only one politician who can be reasonably sure of a good, or at least a polite reception, anywhere in the country. Populist and demagogue she maybe, but she is the one to watch.. 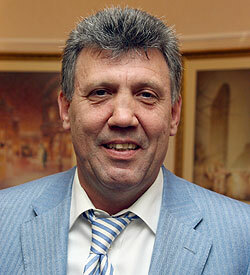 Recently appointed Deputy Prosecutor-General Renat Kuzmin - a man with decidedly chequered background. The Socialist fraction in the VR consider the leadership of Ukraine's Prosecutor General's office to be totally incompetent, and their rulings are being made 'to order'. They say they will initiate an immediate investigation in the VR into 'who is responsible for the complete collapse of the work of the Prosecutor's office'. In particular, the Socialists accuse the P-G's office of attempting to bury the investigation into the death of journalist Georgi Gongadze. "The Prosecutor-General [Aleksandr Medvedko] and the head of the investigative administration Renat Kuzmin..are personally 'whitewashing' all of those persons involved to the crime," they say. In recent weeks the P-G's office has been taken over by what could euphemistically be called 'incompetent' Donetsk 'old-boys'. Yanuk and the Socialists' anti-crisis coalition partners PoR won't be too happy about the Socialists 'rocking the boat'. "Republican party chief Nurmukhammed Khanamov announced on Tuesday that one possible candidate for the presidency, Minister of Defense Agageldy Mamedgeldieva, was arrested yesterday. 140 other officials of lower rank have also been detained. Experts explain this as a struggle for authority. After Saparmurata Niyazov's death, they confirm the country is experiencing a political crisis, because there there is not one outstanding successor." In Kyiv, Turkmen opposition leaders were already touting the Ukrainian authorities for support in exchange for the promise of favourable terms on gas in the future - on the day that Yanukovych was attending Niyazov's funeral. Ukrainska Pravda say "It is difficult to define what the 'Turkmen opposition' really is. There are a few political activists who fell out with Niyazov and moved to Moscow and elsewhere. But they all are products of one national elite who rose to the top on gas money. There are several reasons why they became critical of the Turkmenbashi regime - but in the main they are linked to personal financial/property matters, rather than ideological arguments, so it is probably a waste of time looking for 'democrats' or 'liberals'. Whatever happens, the relationship between the state and its citizens will not change significantly." It was decided at an extraordinary meeting of the highest law-making body of the land, the National Council, that the presidential elections will be held on 11th February 2007, and that six candidates will run, including the deputy minister responsible for the oil and gas industry Ishanguli Nuriyev, and the deputy tourism minister Durdi Durdiev. The acting head of state, Gurbanguly Berdymukhamedov remains favourite, a good indicator was the fact that he headed Niyazov's funeral organizing commission - just like during the dark days of Communism. The country's constitution has been altered to enable him to stand for election. The 'Bat'kivshchyna' political party, the mainstay of BYuT, claim to now have nearly half a million paid-up members in Ukraine. They are quite evenly scattered throughout all of Ukraine's oblasts, and there are some surprises, e.g. they have 7888 and 15720 members in the western Ukrainian Ternopil and Volyn oblasts respectively, whilst for the east Ukrainian Donetsk and Lugansk oblasts the figures are 9566 and 15390 members respectively. Eastern Ukraine is of course more heavily populated that its western regions, but nevertheless, BYuT is the only party whose membership comprehensively covers the country. They seem to be particularly strong in central regions, e.g. nearly 34000 members in Kirovohrad oblast, and 28241 members in Dnipropetrovsk oblast. RFL/RL seem to be amongst the first to provide comment on the implications of the sudden death of Turkmenistan's president Saparmurat Niyazov - Turkmenbashi. Their analyst Daniel Kimmage believes his death could lead to some political instability in the country, and also to a power struggle. "Turkmenistan occupies an important position within Central Asia as a major supplier of natural gas; natural gas that plays an important role for Russia, natural gas that is part of the general system that includes a European supply of gas. So there are major potential implications, for example, if there would be political instability in Turkmenistan it would affect the shipments of natural gas. It could have a far-reaching domino effect that could reach Europe. So there are many possible implications both on a regional level -- where it reminds us that these are not inherently, terribly stable political systems. To the international geopolitical level it touches on a great level the energy-security questions." Other reports are not optimistic either, including this one entitled: "Turkmenistan on the threshold of war"
"There is no obvious leader or political force to take over the running of the country. Opposition leaders have dissappeared, or fled the country. In July, 2006 President Niyazov delegated powers to carry out negotiations at state level to his son Murad, whose political career he had terminated at one time. Murad was even forbidden to live in Turkmenistan. He obtained citizenship of the Russian Federation, and since 1993 has been engaged in business in Moscow - construction of hotels, trade in Astrakhan furs and cotton, and also the sale of Turkmen gas. He is married to Victoria Gogoleva, a native of Odessa. Murad Niyazov does not possess the charisma of his father or the power to allow him to take over the position of president in a peaceful manner. He has been associated with a series of scandals revealing a chaotic lifestyle, e.g, the loss in the Spanish casino in 1998 of $12 million. The only thing he has got going for him is the Eastern tradition of continuity. The future of Turkmenistan is generally perceived as being gloomy. The significant resources which Turkmenistan possesses will cause the fierce struggle for the control over them. The absence of national leaders could lead to a decentralization of the country and to an increase in the role of regional clans in the government, i.e. to a situation similar to that which exists in Afghanistan [Yikes!] and which could lead to armed conflicts and civil war in Turkmenistan." Turkmenistan presently supplies about one half of Ukraine's gas requirements via the infamous monopolist middleman 'RosUkrEnergo'. Putin and Yushchenko will have plenty to talk about tomorrow - Turkmen gas supplies will be top of the list. Today's events outside the CabMin's offices when Borys Tarasyuk was physically prevented from going into a cabinet meeting by PoR deputies, overshadowed what were, perhaps, more disturbing events. It was announced that the former chief prosecutor of the Donetsk oblast, Viktor Pavlovich Pshonka, was today appointed deputy Prosecutor General of Ukraine. He was Gennady Vasilyev's deputy when Vasilyev was Prosecutor General or Ukraine during the first premiership of V. Yanukovych. Pshonka was the man, according to press reports, who on 28th November 2004 ordered Ministry of the Interior troops to advance on the Maidan. Pshonka is also linked, according to some reports, to the murder of a Slovyansk journalist, Igor Aleksandrov, who was clubbed to death with baseball bats in 2001. Alekshandrov was preparing a TV program at that time that was to include a photograph of Pshonka's son Artem in the company of an organized crime gang. Video tapes of the program, together with photos of Pshonka himself in similar company, dissappeared after Aleksandrov's apartment was searched. Psonka oversaw the highly dubious investigation of Aleksandrov's murder in which a vagrant who was allegedly being set up to 'take the rap' for the murder, himself died later in suspicious circumstances . There are lots more other unanswered questions raised in the links above. Pshonka is a close friend of Yanukovych. His 30 year old son Artem is a now a PoR deputy, and a senior aide in the Donetsk prosecutor's office. And in Simferopol, Crimean journalist, Norik Shyrin, a newspaper editor and leader of Crimean Tatar youth movement Birlik [Unity], was found stabbed to death today. He was also a member of the Crimean Rada youth council. Several days ago he had returned from Kyiv with official permission from the national TV and radio council of Ukraine to set up a radio station dedicated to serving young people in Crimea. Tomorrow President Putin arrives in Ukraine. Wonder if Borys T will meet him too, or will PoR heavies block his path? VR deputies from PoR consider that the authority of the members of the Central Election Commission was withdrawn illegally on 8th December 2004, when the Orange Revolution was at its height. Several days ago, on December 15th they registered a bill to revoke the decision to appoint new people to the CEC in December 2004. If the bill is approved it will enable the pre-OR guys in the CEC, including its chairman Serhiy Kivalov [now a PoR VR deputy,] and the other cheats to return. Today BYuT failed to get their bill on the rights of the VR opposition passed, principally because only 23 'Nasha Ukraina' deputies out of 81 present supported it. NU's excuse was that the bill did not include mechanisms for safeguarding the rights of other parties, apart from the biggest party in any opposition group. The Socialists voted toghether with the BYuT opposition against their coalition partners, the PoR, so this was a chance, after the 'kicking' Yush has had lately, to 'put one over' Yanuk. They 'blew it'. Their attitude reminds me of a saying used by a distant Polish relative of mine [a terrific guy] - 'marzeniye scietej glowy' - 'the dreams of a chopped off head'..
Top BYuT man Oleksandr Turchynov called NU's actions 'a betrayal'. How right he was. As I wrote in July, "PoR play 'for keeps.' It is they who are now setting the agenda. Taking command of the VR for them is only the first step. Rendering Yushchenko [and the parliamentary opposition] impotent will be the next..."
They are well on track..
Yuliya T considers that Ukraine is currently undergoing a full-blown political crisis. Evidence of this is the inability of its leaders to agree a state budget for 2007, and the risk that an accord on it will not be reached. She says that there is "complete chaos" within the power structures, and that the Ministry of Internal Affairs is at war with the Presidential Secretariat - Ministerial deputies cannot be appointed by normal legitimate means. The SBU [security service] does not have "a legitimate head, and it is not known when one will appear". The Ministry of Defence "is constantly in a fevered state" because the position of its Minister is uncertain. The Minister of Foreign Affairs [who is currently on duty with the President in South Korea] is barred from attending cabinet meetings, and there are plans to lead him out by the hand from the Foreign Ministry premises. The President says there is enough evidence to 'snap the 'cuffs' on the 'perps' who poisoned him - while the Prosecutor General says the case is unsolved, and the poisoners are not known. "The country has never lived in such a state of chaos and destabilization," she said. She has a point. ByuT will initiate a closed meeting of the VR fraction leaders. "Today at the VR conciliation council Oleksandr Moroz agreed that it is essential to conduct such a meeting." Maybe time for the oligarchic sponsors of the Ukrainian political parties to knock some heads together*..
President Yushchenko again trod on PM Yanukovych's toes when he signed a decree on Friday revoking the appointment of four deputy Internal Affairs Ministers - Fatkhutdinov - deputy head of civic security, Bodnar - head of the main investigative administration, Plekhanov - responsible for personnel and internal security, and V Suslov. They had been appointed just a few days previously by the Cabinet of Ministers. More about this in an Obkom article entitled: "Yushchenko drove out entire Donetsk gang from Ministry Internal Affairs"
The current 'Dzerkalo Tyzhnya' includes a piece entitled: "Yushchenko preparing 'Special Services' for battle with Yanukovych." "The sharpening internal political struggle for the control over law-enforcement agencies, procuratorship, and special services was the most significant event of the past week," it says. The replacement of almost entire Ministry of Internal Affairs leadership by people connected to Victor Yanukovych reveals both that the Vasyl Tsushko [recently appointed Minister of Internal Affairs] is a mere decorative figurehead, and that it is the intention of the leader of Regiony to place under his tight control another lever of power - the police force. At the same time the secretariat of the President is busy creating a new state structure which will give him 'manual control' of the Security Service of Ukraine [SBU]. The anti-crisis majority in the VR is attempting to counteract this process - several days ago they refused to satisfy President Yushchenko's request to fire SBU chairman Ihor Drizhchaniy. Disintegration and destruction of Ukrainian special services as the functioning tool of national security has now become a distinct possibility in the near future, it claims. The reasons for the dismissal of Drizhchaniy were not officially given, but rumor has it that transcripts of telephone intercepts, some including conversations of the president himself were put ont the president's desk by persons wishing to discredit Drizhchaniy, so demonstrating Drizhchaniy was working against the Head of State. Viktor Yushchenko is also disturbed by the close ties between Drizhchaniy and the Prosecutor General's Office, and by SBU's reports that head of the Presidential Secretariat Viktor Baloha's is meeting with Viktor Medvedchuk [to many Viktors for my liking], and other matters. The 'DzT' article speculates that the President is attempting to gain firmer control of the SBU to give him 'greater freedom of action' in the even of early parliamentary elections, and in event of a 'power scenario stand-off' between branches of state authority. ps Good 30 minute radio documentary from BBC Radio 4 'The Litvinenko Mystery' here. It starts a couple of minutes into the broadcast..
Update: The four deputy Internal Affairs Ministers are working on, and ignoring the President's 'ukaz'. The opposition group "Democratic Kyiv" into which have entered fractions from 'Our Ukraine', BYuT, and the Klychko bloc, has initiated proceedings to cancel the proposed draconian tariff increases. However, as sources in KyivRada itself confirm, the 'democrats' position is shaky - to be in opposition to the present mayor is not simple. The majority of deputies who entered the KyivRada, have behind them several business-structures. As soon as these deputies start 'kicking up a fuss' the structures become the target of every possible kind of supervisory body. For example, this has happened with the leader of the OU fraction Dmytro Andrievskiy, who for more than a month now has been 'communicating' with tax men at his 'Kyivpidzemshlyakhbud' enterprise. Chervonetskiy openly warned all deputies not stray from 'a general line': "I am preventing some leaders of 'Our Ukraine' from [approaching] the budgetary trough - they thought that after the elections and beyond, they would continue to slurp there." However, the chairman of 'KEH" Yuriy Bondar, has said that there are many chronic problems in the infrastructure that demand immediate attention e.g. repair of collapsed pipes, completion of a third block on Troyeshchyna power station, and so on.. But opposition deputy Volodymyr Bondarenko from the Pora fraction revealed that utility receipts provide for the maintenance of hunting lodges, recreational complexes, a dining room at 'KyivEnergo'; and 1,4 million hryven is allocated just to load up buffet tables and junkets. According to one opinion poll, 57 % of Kyivites are not going to pay the new tariffs - and 69 % said they would support a referendum to sack Chervonetskiy. In a 5-iy Kanal program on Thursday which is worth watching in full, Yuliya T. warns viewers that schemes are being put into place that will enable KEH to seize apartments of persons who do not pay up the increased tariffs, and so enrich themselves even further. She also admits that some BYuT deputies in the Kyiv city coucil have given in to temptation and bribes, and are now supporting Chervonetskiy. At the same time in Eastern Ukraine, a spokesman for the executive committee of Lugansk city council stated that it has been compelled to skim off unsanctioned gas for which it cannot pay from the gas transport network. Only 23% of Lugansk consumers have settled outstanding heating charges, and only 18 % of bills for November have been paid to the the city power company 'TeploKommunEnergo'. Looks like big trouble brewing..
She was fed up with high gas bills and went to the gas utility company to complain. They asked her whether she had a gas meter. When she said she hadn't, the man told her, "Get yourself a meter, and the bills should fall dramatically." She took his advice and had a good meter installed. But the next bill came - and it was even higher than before. She stormed down to see the man at the gas utility company again. "You told me to get a meter to reduce my bills. I did exactly as you suggested, but the gas bill is even higher. What's going on here?" The man calmed her down, and asked her, "Yes, but what kind of meter did you have fitted?" "Why, a good one - a German one," she replied. "Ah, this is no go good," and paused, adding, "You should have got a Russian meter." On December 12th the VR elected the controversial figure of Nestor Shufrych to the position of Emergency Situations Minister, with added responsibilities for clearing up the Chernobyl mess. Shufrych, who is a currently a deputy in the Crimean autonomous legislature, was a Social Democratic Party-united [SDP(o)] lawmaker in the preceding VR, and for a while SDPU(o) deputy when the odious Viktor Medvedchuk was its chairman. His nomination by Yanukovych and unexpected elevation to cabinet minister is seen by many as a 'poke in the eye' for Yushchenko and the Oranges. The Emergency Situations chair was vacated by Viktor Baloha three month ago, when he left to head the Presidential Secretariat. During the 2004 Orange Revolution, Shufrych, a tenacious pit-bull terrier of a man, was Yanukovych's representative at the Central Election Commission. On one occasion during the OR he was seen on TV staggering half naked, holding his torn shirt after a scuffle with Orange leaders in the Election Commission building. Another time he drove into some Orange demonstrators, but was rescued from what could have developed into a serious incident. He was Yanukovych's proxy in the Supreme Court, challenging the result of the December 26th re-run of the elections. His name has cropped up in criminal fraud investigations and publicity stunts, in some of which he has allegedly assaulted others but also has claimed to be a victim of assault. He is just that kind of obnoxious guy that make other folks take a swing at him - in other words, a troublemaker. The colorful Shufrich has been accused of being a wife-beater, and has registered property in his mother's name in various financial schemes which were under investigation. He was honorary chairman of the Zakarpattya soccer club, where special forces arrested around 30 people, seizing and arsenal of hand guns and automatic weaponry. Shufrych, according to magazine gossip columns, is often seen with glamorous ladies in the capital's nightclubs - the sort where white powder is allegedly sniffed, and years ago it was even rumored that, for a while, he was Yuliya T's boyfriend. Shufrych is not on a PoR party man. I'd bet that many PoR deputies are not happy about the appointment of this man, who has been described as a walking 'Emergency Situation' himself. I'd bet PoR's image-makers are none to happy either. He won't attract more votes to PoR. But Yanuk just couldn't resist pulling his 'attack dog' out of the kennel, maybe as a riposte to Yush's recent appointment of one of Ukraine's richest and most successful businessmen, Valeriy Khoroshkovskiy, to the National Security and Defense Council [see previous posting], or maybe maybe because he is annoyed that the president has vetoed the 2007 budget. Its just part of the trial of strength going on between the two Viktors. Today President Yushchenko appointed Valeriy Khoroshkovskiy deputy secretary of the National Security and Defense Council of Ukraine, providing, according to some experts, further evidence that the President is strengthening a team around himself in anticipation of early VR re-elections next year. Vitaliy Hayduk, part owner of one of Ukraine's largest Financial Industrial Groups, Industrial Union of Donbas, was recently appointed NSDC secretary. Khoroshkovskiy, 37, is also one of Ukraine's richest men. He is executive director of the Yevraz Steel Holding, one of Russia’s largest steel companies. He held the post of deputy head of the Presidential Administration under Leonid Kuchma’s tenure, and was also Economy Minister responsible for the country’s European integration policies. He is co-owner and chairman of the the supervisory council of Ukraine's most popular TV channel, Inter, so...a big beast. Rinat Akhmetov was rumored to have been interested in purchasing Khoroshkovskiy's media interests, but the asking price of $1Bn was too high, even for him. Presidential Secretariat Chief of Staff Viktor Baloha was recently appointed head of 'Our Ukraine', some say to 'clear a path' for Yuriy Lutsenko to eventually take over the party. One of the main planks in any possible 2007 re-elections would be a cancellation of political reforms, which have weakened presidential powers. A referendum on political reform could take place in conjunction with re-elections. A recent declaration by the still popular Yanukovych, that he is ready to participate in a presidential campaign in the event of a political reforms being cancelled, may indicate that he is taking these matters seriously. If he were to win, then it would be he who would benefit from any enhanced presidential powers. Tymoshenko has long supported early re-elections in order to increase the number of BYuT deputies in parliament, but would find the elevation of Yuriy Lutsenko to the position of NSNU leader unsettling. On the 9th of December she met Lutsenko and discussed the question of co-operation of democratic forces in the event of early parliamentary elections. At a later press briefing she said, "He spoke [with me] as someone who intends to go over to the opposition circle of operation and is currently striving to find his place, so as not to split the democratic forces." When asked if she proposed a place for Lutsenko in her bloc, she replied, "I think we will work as a co-ordinated, unified team." Lutsenko has promised to reveal more details of his political plans on December 14th. A thought: If just over a year ago the Ukrainian government refused to pay a fourfold increase in gas prices, resulting in a massive international furore, then why should Ukrainian consumers pay threefold increases in their housing and utility costs? And, more to the point, will they? Over the last few days the Socialist Party of Ukraine, although they only have 33 deputies in the ruling anti-crisis coalition [Acc], have used their votes to great effect. They, together with opposition parties BYuT and NSNU voted through the motion to recognize the 1932-33 Holodomor as genocide. The reaction from PoR was muted, and there will be no action taken against the two PoR deputies who voted with the opposition. The Socialists then voted first to keep their former party member Yuriy Lutsenko in the Minister of Internal Affairs' chair, and on the next day, after a deal was done, voted to dump him. Now the Communists are getting grumpy, and are threatening to 'sink' the Acc. Unsurprisingly, Yuliya T. has been talking up the possibility of the Acc crumbling in the spring, creating the need for early elections. Other nat-dem leaders, unhappy with Yushchenko's leadership, are not excluding this possibility either, and are regrouping. The former head of the NSNU executive council Mykola Katerynchuk may be forming a new political movement, "European platform for Ukraine" which may eventually become a political party. A founding committee meeting is to take place on the 14th December. Meanwhile, the Socialists can feel quite smug. PoR have to consult them on every motion in the VR because their support and votes are essential. But the Socialists realize, that if they are to have a political future, they have to show the electorate they are not PoR's poodle, and are still semi-detached from them. In the event of an orange coalition being recreated, they will still be required - it must feel good to be wooed by both the oranges and the blues. The only danger to the Socialists is a possible PoR-NSNU coalition, an arrangement Rinat Akhmetov supposedly favors. The political situation in Ukraine is maybe not as stable as some think. The Communist Party of Ukraine , whose 21 deputies form a vital part of the ruling Anti-crisis-coalition, are beginning to throw their rattles out of the ACC pram. Apparently today at a pleniary party session, a heated discussion took place about 'the situation in Ukraine, and relations inside the ACC." A Crimean VR deputy, Leonid Drach, complained that undertakings which were given to them are not being adhered to, for example the Socialists voting in support of the Holodomor bill. He claimed that PoR are not fulfilling agreements made about 'cadre questions' in Crimea and other regions. "The further development of such processes in untolerable," he said, adding, "If these mistakes are not corrected then the KPU retains the right to leave the coalition." Ooooh. Ukraine's 450 seat parliament yesterday approved the 2007 state budget by 249 votes to 6. One of its more cynical directives is the exclusion of parliamentary deputy/pensioners from laws that cap maximum state pensions paid to Ukrainian citizens. Normally these are limited to twelve times minimum legal wage, or 10 thousand hryven. The budget for maintaining the VR apparatus is burgeoning. Between the first and second reading of the budget an increase of 30 million hryven was proposed, but suddenly this increased to 60 million, up to a total of 700 million hryven. This exludes 15 additional millions for upgrade of the deputies' Crimean sanatorium " Gurzuf ", and 42 million for improvement to their private hospital in "Feofaniya". At this rate it is estimated that the cost of running the Supreme Rada, by 2008, will exceed one billion hryven. Basic increases in the the minimum wage and minimum living allowance, which president Yushchenko had demanded in a letter to prime minister Victor Yanukovych and VR speaker Olexandr Moroz, have not be included in the budget. According to the head of the VR budgetary committee, Volodymyr Makeyenko, 5.5 Bn hryven would have had to be found for this purpose. The opposition now believe that the government coalition has left Yushchenko no other option but to veto the budget. The 2007 budget proposes that the minimum wage is increased next July by 20 hryven - up to 420 hryven per month i.e. about $84, then to 450 hryven in December next year. Quote from Viktor Pynzenyk - ex-finance minister: "We have a unique budget - a budget for dividing up the incomes of citizens in the interests of a small group of people. On the one hand they plan economic growth, but on the other they do not allow people to live better, even by one kopek. Even though the year has not yet ended, calculations are made based on inflation at 8.7%, even though already today it stands at 10.6%, and by the end of the year is expected to reach 14%. This means the value of pensions will drop by 8-9%, i.e. a real reduction in the purchasing power of pensioners. The same is happening amongst workers in the budgetary sphere - there will not be a 'better life' either for pensioners, or for teachers or medical workers." And housing and utility charges are increasing two- and three-fold.. Many, if not the majority of VR deputies are multimillionaire businessmen. They consider themselves to be of a higher caste, and the laws which they pass apply to the lower orders only, and not to them. P.S. Recently-sacked minister of the interior Yuriy Lutsenko, presidential adviser Taras Stetskiv, Vitaliy Klychko, and disillusioned NSNU VR deputy Mykola Katerynchuk were seen together is the swanky Le Grand Cafe in Kyiv, but denied they were planning a new political project or party...hmm..
sI am the one who moderates the comments. I do this because of all the spam that can end up on the site. But I have been a bit lax recently in doing this. I'll have something more to say about this later but I have moved my family out to a village outside of Kiev and we are building a house. It has been a real experience. (What we have been through could be the subject for a book and a separate blog.) And we hope to have it done in the next couple of weeks. But that and the other work I have to do has left me very busy and that has resulted in the lag time for getting your comments posted. Sorry about that. I'll try to do better on it. The comments as always add a lot so I hope you keep them coming. By the way, this blog has ruthlessly suppressed spam and personal attacks, nothing else. While Viktor Yanukovych is in the USA discussing, amongst other matters, the struggle against corruption in Ukraine, [AUR #794] corruption continues unabated in his own KabMin back home. "On November, 20th «Обком» wrote about participation of high-placed officials in corrupt deals in field of power generation, in particular the lobbying of the Hungarian company 'Еmfesz kft', which is directly related to the notorious Dmytro Firtash. This has ended with the setting up a contract for the delivery of 160 MW/hour of electric power to Hungary, and to a company run by friends of vice-prime minister Andriy Klyuyev, which is to receive 45 MW/hour of electric power for export. The specified companies at the time of signing of the contract had no licenses for operating in the field of electric power. Reliable sources have informed us, that PM Yanukovch read out 'Obkom's' previous revelations to his colleagues, and on November 22nd had a stern conversation with vice-prime minister Klyuyev about these schemes. Victor Fedorovich demanded that these disgraceful shinannigans should end. Ironically the conversation between the two «донов» took place on the second anniversary of the "Orange Revolution" - and the KabMin discussed the topic of corruption amongst orange ministers, and yet publicly nothing has been said about corruption in the energy sector of the government which is dominated by PoR. PM Yanukovych has remained silent on Klyuyev's and [Fuel and Energy minister] Boyko's "schemes" to export electric power. Moreover, after vice-premier Klyuyev received his 'dressing down', he, together with his friends merely ineptly disguised their participation in the corrupt scheme, ostensibly by selling their share of the deal to the Slovak company 'Energo Odbyt'. In particular, as we reported earlier, the 'Energo Odbyt' company, until 26th October 2006, was called 'Affinity', which was owned in turn by several citizens of Slovakia. The last Slovak owner of the company was a certain Yan Mital, who owned it from 22.12.2005 until 17.10.2006. After this it became enmeshed in the "Donetsk" scheme: the owners of the company became "S-Plus Trade", Tamara Lysenko from Donetsk, and Alexander Rukhlyada, also from Donetsk. Tamara Lysenko is a business-partner of the Klyuyev brothers involved in export of coal from Ukraine. It is known that Nikolai Pashkevich who heads 'Ukrinterenergo", and vice-premier Andrey Klyuyev, have friendly relations. And so, after the 'man-to-man' conversation between prime-minister and vice-premier, the Justice Ministry of Slovakia website [link provided on source webpage] posted certain changes, namely: Tamara Lysenko and Alexander Rukhlyada have sold the shares in the company "Energo Odbyt". And though on the day of our publication - on November, 20th - the website site of the Ministry of Justice of Slovakia gave the above-mentioned citizens of Ukraine as registered proprietors, after a few days their Slovak comrades changed this, and and instead of Lytsenko and Rukhlyada, the shareholders of 'Energo Odbyt became a certain company called 'Surety'. But amazingly, that same site of the Slovakian Ministry of Justice specifies that 'Surety' was founded on 27th October 2006 and is totally owned bya Czech company 'Garzone' whose business activities includes trade in the goods, intermediary trade services and real estate rental. This dubious company 'Garzone' was set up on 13th February 2006 and is jointly owned by a Kristina Vencelova (50 %) and Helena Kucinaiova (50 %). We have no doubt that these two Czech ladies have already sold an option to two Ukrainian citizens on purchase of their shares, and can state with confidence that Tamara Lysenko and Alexander Rukhlyada had simply transferred their shares on a temporary basis to hide loose ends, but on the Ministry of Justice of Slovakia website all of them equally appear involved in 'Energo Odbyt' and continue to work on the supervisory council of the company. Probably, these two loyal comrades of the president of 'Ukrintenergo' simply didn't not have time to hide behind a chain of companies because it was necessary to urgently sign contracts on the export of the electric power. So it turned out thus: "We wanted matters to work out for the best, but it turned out the same as always". In the meantime, while friends of vice-premier Klyuyev searched for ways to cover up their tracks, the second participant of scandal, the company "Еmfesz kft" i.e. Yuriy Boyko and Dmytro Firtash, received from 'Ukrintenergo' 160 MWatts/hour of electric power for export, and strove to formalize its export to Hungary. In Hungary the supply of electric power and related business is conducted in an open, competitive market, so the Hungarian state power utility company conducted an open bidding competition. As a result, Firtash's 'Еmfesz kft' could only acquire the right to deliver 1 MWatt/hour of power. Therefore, Mr. Firtash, had to think again. Having understood that in Hungary he cannot receive a necessary quota by simply applying administrative pressure and, probably, after a friendly consultation with fuel and energy minister Boyko, he decided to direct a delegation of "experts" from Hungary to prime-minister Yanukovych in order that he convice the Hungarian side of the need to give the necessary capacities for the supply of electric power to 'Еmfesz kft'. Now all that remains to be seen whether Victor Fedorovych will listen to Firtash's comrades and introduce shadow schemes for export of electric power from Ukraine at an international level, and also observe the Hungarian government's reaction to this. The Klyuyev brothers are now investing their mazuma in Austrian real estate. *A cynical explantion given to me many years ago by an Ukrainian when I queried him on his abuse of his official position. More O.P.s which reveal fluidity of the Ukrainian electorate here. I've translated portions: "Ratings of the Party of Regions in November 2006 have dropped by 7% in comparison with the previous month. If elections to the Supreme Rada [VR] took place on Sunday, PoR would obtain 28% of the vote, The Communist Party of Ukraine, Socialist party of Ukraine and the Nataliya Vitrenko bloc would obtain 4%, 2% and 1% respectively. Yuliya Tymoshenko's block would receive 18% of the vote, and Our Ukraine - 6%. “ A bipartisan system is being formed in Ukraine. If the authorities do not compensate somehow for increases in the cost of services, housing and utilities, then the dissatisfaction of population will be converted into support for the opposition, and by the Spring BYuT's ratings will grow, " said expert- sociologist Eugene Kopatko. In the event of the appearance of a third force then it would takes votes away from Tymoshenko, he added. In another O.P., 45% of respondents consider that the acting government to “significant degree” protects the interests of the Donets region, 38,8% said the government protects the interests of large Ukrainian capital, 29,5% of Russian capital, and 29,5% of shady business. Only 13,5% of Ukrainians consider that the new government to “significant degree” protects the interests of simple citizens. In August, 55% of Ukrainians positively assessed the appointment of Yanukovych as Prime Minister. Didn't take Lutsenko long to get another job - today he was appointed as a Presidential adviser by Presidential decree. A recent article in 'Dyelovaya Stolitsa' provides an explanation for last week's sacking of the popular Minister of the Interior, Yuriy Lutsenko. Both Yanukovych's PoR, and Yushchenko's NSNU perceive BYuT as the biggest threat to their power. NSNU in particular are in 'free-fall' and fear Tymoshenko will become undisputed leader of the 'orange' forces. Even though Lutsenko was an 'orange' minister, he was somewhat surprisingly kept on by Yanukovych when he became P.M.
PoR are acutely aware that they were able to form a coalition government after the March 2006 elections only as a result of splits and squabbling amongst the orange parties. The article suggests, therefore, it may be in both the President's and Prime Minister's interest that a new pro-presidential 'orange' party comes into being. So they have colluded in the ousting of Lutsenko, each for his own purpose. At the end of October this year, according to results of sociological research company Research & Branding Group, Yuriy Lutsenko's activity as Interior Minister was rated positively by 29 % of those questioned, exactly as many as rated positive the activity of Yuliya Tymoshenko. Only one politician had a higher rating - Victor Yanukovych. Trailing well behind them where Oleksandr Moroz, Petro Symonenko and Viktor Yushchenko. Similar results were obtained by analysts of the monitoring service of the President's secretariat, who reported to the President that amongst the new generation politicians, Yuriy Lutsenko is the best candidate to become the leader of some kind of new, effective 'orange' political force. The trust in him has even increased to 34 % over the last three months. So Yuriy Lutsenko is seen as the only political figure who can give Yuliya Tymoshenko serious competition amongst orange voters. Yushchenko, on day of the anniversary of Maidan declared that he, "will welcome the creation of new association of national-democratic forces". The only thing missing for the new project was a leader. It seems now that at last the President has decided on Lutsenko. As a test of NSNU's reaction, Lutsenko was sent as the envoy of the President to the recent 'Our Ukraine' congress. He was warmly received by the party's rank and file. The financial and administrative base for the new political project is to be provided by four components: the business groups of Russians Michael Voyevodina and Alexander Babakov (today the head of Russian opposition party "Rodina" which was once close to the Socialist Party of Ukraine); Igor Kolomoysky's 'Privat' group; Vitaliy Hayduk's 'Industrial Union of Donbas'; and the project is to be supervised by the head of presidential office, Viktor Baloha, who has access to state administration structures. BYuTivtsi have quickly reacted to the possible threat from such a new political force. Yuliya T's #2, Oleksandr Turchynov recently declared that he does not see Lutsenko as the head of a united opposition, Tymoshenko has called Lutsenko an ineffective Interior Minister, and Lutsenko has had 'digs' at Tymoshenko in the media. Interesting O.P. in today's "Donbass" newspaper on percentages of Donetsk citizens who still support independence, 15 years after Ukraine' indendence referendum. Then 90% of Ukraine's citizens supported indepence. This figure was lower in Ukraine's eastern oblasts e.g 76% supported it in the Donetsk Oblast. The O.P. provides figures in the following order [from left to right] for various 'strata' of society - [Blue collar] workers, [White collar] workers, Business sphere, Students, Pensioners, and Unemployed. In the business sphere, and amongst students, the majority of respondents support independence - 50% and 57% respectively. White collar employees are almost evenly split 50/47. All the rest were against independence - pensioners in particular. Only 791 persons were questioned, but nevertheless the most dynamic parts of society in the Donetsk region seem to be in favour of independence. So today the Socialists almost unanimously supported their anticrisis coalitionists - the PoR and Communists, and fired Minister of Internal Affairs Yuriy Lutsenko, even though yesterday they twice voted against sacking him. In exchange, VR deputies appointed Socialist leader Vasyl Chushko as the new Interior Minister. There are rumours that PoR deputy Mykola Dzhiga may become Deputy Interior Minister, a position he held under Kuchma at the time of Gongadze's murder. During a meeting of representatives of CIS ministries of the interior in Tbilisi on May 16th 2001, Dziga declared that journalist Georgy Gongadze was killed by two drug addicts. Meanwhile, Prime Minister Viktor Yanukovych today visited the Mariupol Met-Kombinat [MMK] im. Illich - a huge steel plant run as a worker's co-operative in the town of Mariupol. Its general director is Socialist VR deputy Volodymyr Boyko. A curious exchange took place when they both met journalists. Yanukovich assured them that the parliamentary coalition will get stronger. Then he turned to Boyko and said, " Here is Socialist Boyko, " to which Boyko briskly retorted, " I not a member of the party".
" But you are in a coalition, " replied Yanukovych, and on receiving confirmation, added, "So this means, the coalition will get stronger ." President Yushchenko was also supposed to be in Donbas today too, but cried off at the last moment..
Yuliya T had a dig at Lutsenko too, claiming that when she was prime minister she was personally subjected to aggression and repression from Lutsenko's direction. She claims that during the so-called 'sugar crisis' when she tried to import cheap sugar into the country, Lutsenko personally opened a criminal case against her. She also claims that Lutsenko achieved little as minister of the interior [too true]. Despite this, she says that is was a big mistake for some ByuT deputies to break ranks and help vote Lutsenko out of office. Perhaps as a riposte, Lutsenko, in an interview declared that the only prime minister who ever tried to pressurize him was Tymoshenko. Working with Yekhanurov was easy, he says, and Yanukovych never tried to give him pointers as to what to do. Foreign Minister Borys Tarasyuk's sacking today was more significant than all of this, but others will no doubt be writing in greater depth about it. This Thursday morning the VR passed a resolution to refer a motion to the government to sack Minister of Internal Affairs, Yuriy Lutsenko, a leading orange 'field commander' who had somewhat surprisingly remained in the cabinet after the March 2006 parliamentary elections. Supporting the resolution were a 'full house' of 186 PoR deputies, a 'full-house' of 21 Communist deputies, 4 Independents, 2 from NSNU, 18 BYuT deputies, and 1 Socialist deputy, providing a a total of 232 votes. Many of the 18 opposition BYuT deputies who broke ranks with the remainer of their party are rich oligarchic party financiers. Their actions in the morning vote provoked a stern reaction from the party leadership who immediately threatened to 'kick out the traitors'. Tymoshenko commented that the opposition's aim should be to topple the Yanuk government, not sack the Interior Minister. Even though Lutsenko has broken away from his former party, [the Socialist Party] after its leader Oleksandr Moroz 'betrayed' the Oranges and joined the anti-crisis coalition with PoR taking the job of parliamentary speaker, it seems Lutsenko has the confidence of almost all of the Socialist VR deputies. This despite rumours that the new Socialist fraction leader Vasyl Chushko is being pencilled in by the Yanuk government as a replacement for Lutsenko. In the afternoon's follow-up vote to sack Lutsenko, the motion just failed to gain the necessary 226 votes - only 223 deputies voted to get rid of the Minister of Internal Affairs, primarily because this time only 11 BYuTivtsi supported the motion, and again, only one Socialist voted 'for'. One or two other VR deputies probably failed to turn up to vote after a liquid lunch, or were otherwise occupied. The leader of the PoR VR fraction Rayisa Bohatyrova said that they'll try and oust Lutsenko again tomorrow [Friday] when 'the knives will also be out' for Minister of Foreign Affairs Tarasyuk, and Minister of Defence Hrytsenko. Lutsenko has a reputation amongst neutrals as being 'relatively clean', and in politics is it often dangerous to 'only wound, but not kill'. Some observers say that the anti-crisis coalition and the Yanuk government could remain in place until 2009, when the next Presidential elections take place. The Socialists have shown they are still a disciplined political force and there is, no doubt, some very serious lobbying going on right now. Many more close and unpredictable votes will be cast in the weeks to come in the VR, and maybe PoR are not as invincible as some think.